Slightly pitted with several dents. 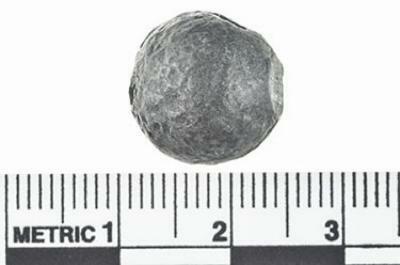 1 of 4 round shot recovered from blunderbuss barrel. See also 86.08.0657a, b, d, e.Packed and transferred on Dec. 15, 2012 to Frazier International History Museum representative Katie Savale for shipment to Frazier International History Museum for Spirits of the Passage traveling exhibit.